Kim Komando, “America’s Digital Goddess,” is a leading radio host and web entrepreneur. Every month her video-taped three-hour weekly radio show adds 2.8 TB of video content to its extensive playback library. 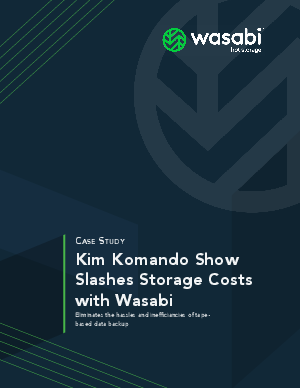 Switching from their current storage solution, a combination of NAS Arrays and Tape Drives, to Wasabi not only generated huge savings it was simpler and faster. Plus, since Cloudberry works seamlessly with Wasabi the show also enjoys efficient and cost-effective remote data protection. In this Case Study read in detail how the ‘Kim Komando Show’ made the transition to next generation cloud storage. Free Trial Available: 1 TB. 30 Days. No Credit Card Required.